Apple’s big iOS 12 update is now out in the wild and available for everyone to download, and if our social feeds are anything to go by, that’s exactly what they are doing in droves. Apple’s iOS updates are usually a pretty safe bet, especially after months of betas that did not yield any showstopping bugs, but that doesn’t mean everything will be plain sailing for everyone. In fact, depending on the email solution you use, you might be in for a world of pain, at least for a couple of days. This comes after the Microsoft Intune Support Team blog published a post relating to Intune support for iOS 12. As it turns out, while support is indeed in place, there may still be issues depending on the functionality being used, especially relating to email. In fact, if you or your teams use Intune or MDM (Mobile Device Management) for Office 365, email access may simply be unavailable. It’s not all bad news, though – the issue is known and a fix has already been devised. The bad news here is that it could take up to 48 hours to take effect due to the safe rollout process that is in place. Known issue: We’re posting this in the Office Message Center regarding a known issue with native mail (this does not affect the Outlook app for iOS). There’s a known issue with iOS 12, EAS, and conditional access policies. 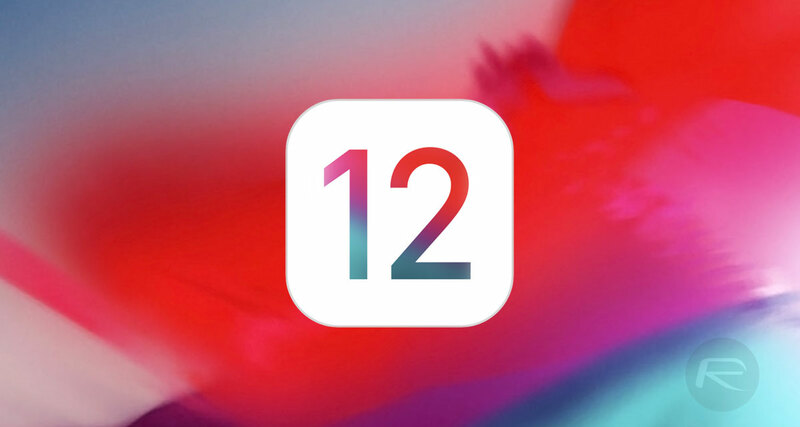 Customers whose end users update to iOS 12 immediately on the September 17th expected iOS 12 availability may find that their iOS native mail app is blocked by conditional access even if they meet the criteria to pass the policies. 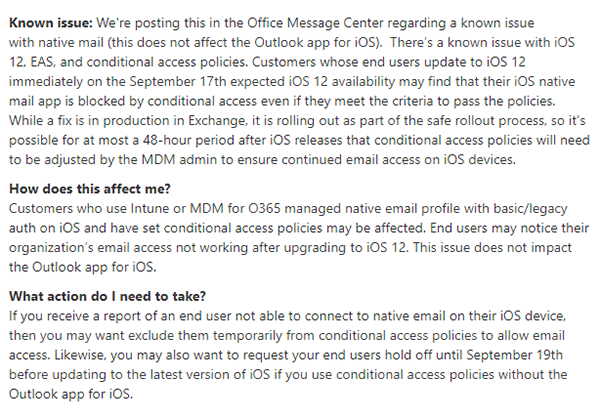 While a fix is in production in Exchange, it is rolling out as part of the safe rollout process, so it’s possible for at most a 48-hour period after iOS releases that conditional access policies will need to be adjusted by the MDM admin to ensure continued email access on iOS devices. The upshot of all that is simple. If you’re likely to be impacted, don’t update to iOS 12 until at least September 19th, just to be safe. 3 months of iOS 12 beta weren’t enough for Microsoft to test its systems ? I switched to using the MS outlook app recently. It’s an upgrade to built in mail and calendar. I was really surprised. Try it if you’re having issues, supports heaps of accounts. Except, it’s the iOS native mail app…. and this isn’t the first time Apple’s screwed up exchange. As noted in the article, the Outlook for iOS works.